We divided the FAQ into two sections. The first one is a Product FAQ, for normal people that just want to unblock streaming services and don’t really care what’s happening under the hood. The second part of the FAQ is technical and dedicated for geeks. 1. What's Keenow and why should I use it? 2. What's the difference between the free Lite plan and the Premium plan? 3. How do I start using the service? 4. Which countries does Keenow support? 5. What platforms does Keenow support? 6. Who is the team behind Keenow and what made us build the service? 7. I've installed everything right but Netflix US still doesn't work! What to do now? 8. I did everything but the Netflix App still doesn't work. Why is that? 9. My IP address was not assigned to a US location! What's wrong? 10. How can I uninstall Keenow? What's Keenow and why should I use it? Keenow is a powerful VPN and Smart DNS service that allows people from all over the world to protect their privacy, enhance their security, and access websites and apps that are otherwise blocked for them due to censorship or geo-fencing. What's the difference between the free Lite plan and the Premium plan? Keenow Lite - a free version of Keenow with 512MB bandwidth per day, which can be used to overcome censorship and unblock websites and apps. The free Lite plan consists only on the Smart DNS technology, and therefore does NOT include any security or privacy features. Keenow Premium - Everything included with the Lite plan, plus full VPN access to protect and conceal your online identity, secure your Internet connection, access to Android, iOS and Amazon Fire apps, Virtual router (Windows 7+), unlimited bandwidth and non-U.S. servers access. How do I start using the service? Easy - just press on the ‘Get Keenow’ button above and follow the instructions. Which countries does Keenow support? Keenow Lite allows access to U.S. servers only. Keenow Premium allows you to access all the countries listed on the Keenow Network Map. What platforms does Keenow support? Please refer to the Keenow Setup Page to download apps for Microsoft Windows, Mac OS, iOS (iPhone and iPad), Android, Android TV and Amazon Fire. In addition, manual setup guides are available for other devices. Who is the team behind Keenow and what made us build the service? Keenow was developed to overcome web censorship by Keen Media Group, a team of IT professionals from various countries. We have a very strong stance against geo-blocking and the fact that International end-users like us are discriminated compared to our U.S. peers, and therefore we have built Keenow out of ideology. We invite you to visit the European Consumer Organisation website to thoroughly understand why Geo-blocking is a very wrong business practice. I've installed everything right but Netflix US still doesn't work! What to do now? This section relates to Netflix for web (i.e. www.netflix.com). If you are enquiring about the Netflix app (i.e. iPhone, Android, Playstation, etc...), then please jump ahead to the next question. Avast AntiVirus Users: Please first turn off the Avast Secure DNS - Instructions can be found on Avast AV Secure DNS website. Please head to the Troubleshooting Wizard and run through all the checks. If no errors are detected by the wizard, then please try to access Netflix through a different browser - i.e. Microsoft IE / Edge or Mozilla Firefox, and see if the issue is solved. If a different browser doesn’t work, then it means that your device DNS cache is causing issues, and you'll need to Purge your Operating System cache - please follow this Flush DNS Guide. Mozilla Firefox - Please install the DNS Flusher add-on for Firefox and press the Flush DNS icon. Google Chrome - Please follow the 'Flushing your Cache through Google Chrome' section of this helpful How-To Geek guide. Everything should work well now. If it doesn't, please feel free to contact our support team and we'll do our best to assist. I did everything but the Netflix App still doesn't work. Why is that? Please follow the Netflix App guide to unblock the Netflix App. Unlike Netflix for web (www.netflix.com), most Netflix apps use hard-coded DNS settings, as well as hard-coded IP addresses - which means that it is nearly impossible to unblock the Netflix App using Smart DNS. My IP address was not assigned to a US location! What's wrong? Unlike most unblockers that rely on Virtual Private Networks (VPN), Keenow mainly relies on the Smart DNS technology to unblock content, and therefore using the basic unblocking feature of Keenow would not change the device's IP address. We do recommend to read the Technical FAQ section below to understand more about the differences between Smart DNS and VPN's. It is important to note that the premium version of Keenow also includes unrestricted VPN access as well as state-of-the-art VPN client. How can I uninstall Keenow? Firstly, we are really sorry to see you go - and we would really appreciate your feedback. Please feel free to share your thoughts by contacting our support team - our CEO reviews the support tickets daily. The Keenow Smart DNS Suite for Microsoft Windows adds an uninstallation entry to the Control Panel / Settings menu. You can uninstall the product by accessing the Start Menu and then Control Panel -> Add/Remove Program menu (Windows 7) or Settings -> System -> Apps and Features menu (Windows 10). 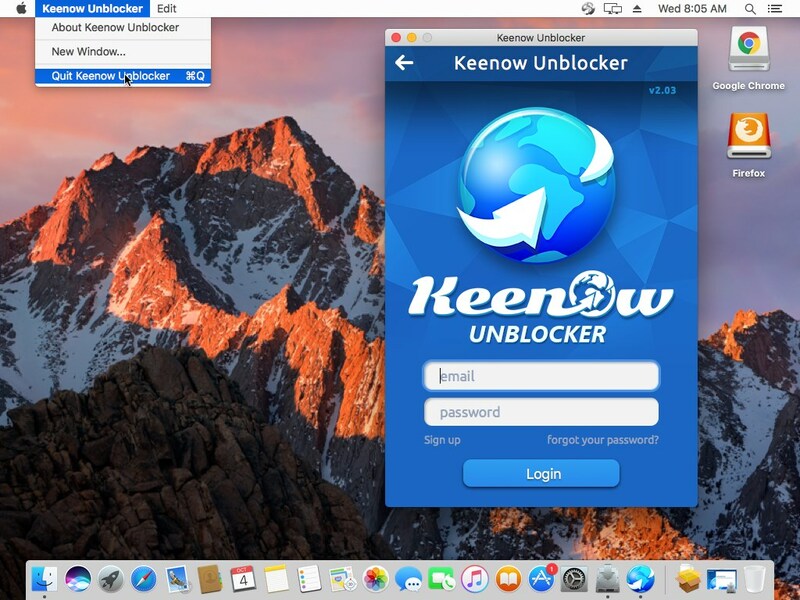 Mac OS Users would first need to quit the Keenow app. Open Keenow, click on the Keenow Unblocker entry on the top menu bar and choose Quit Keenow Unblocker (refer to the image below). Open Finder, head to the Applications directory and drag the Keenow icon to the trash can. 1. What is the technology behind Keenow? 2. What is a DNS? 3. What is a SMART DNS? 4. What is a VPN? 5. What are the advantages of a Smart DNS service? 6. What are the disadvantages of a Smart DNS service? 7. Why devices and browsers cache DNS queries? What is the technology behind Keenow? Unlike most unblockers that solely rely on a VPN technology, Keenow mainly relies on the Smart DNS technology to unblock websites and apps. The Smart DNS technology allow us to provide a generous free plan (Keenow Lite) which can unblock hours and hours of online HD streaming everyday. The premium version of Keenow also uses the VPN technology, and includes an unlimited bandwidth VPN plan. DNS stands for Domain Name Server. When a device is trying to connect to a remote server, the IP address of that remote server must be included in the request. Since IP addresses are usually hard to remember, a typical human-being would much rather remember a domain name such as 'Facebook.com' than an IP address such as 66.220.156.68. When encountering a domain name, your device first connects to a predefined Domain Name Server (DNS) which resolve the domain name to an IP address, allowing the device to send a request to the proper IP address - the network destination. This is where Keenow steps in. Smart DNS is basically a customised DNS server which resolves domain names of streaming sites to proxy servers which are (normally) located in the U.S, allowing you to unblock U.S. streaming sites no matter where you are situated right now around the world, and without compromising the speed of your Internet connection. A Virtual Private Network (VPN) is a network technology that creates an encrypted network connection over the Internet between a client (you) and a remote server. Since military-grade encryption is being used, no one can decrypt the data flowing between the client and the server unless they have the proper decryption key - not your ISP, not hackers, and definitely not your government. In most cases, remote VPN servers are located in the U.S. and therefore you are being assigned with a U.S. IP address which allows use to access U.S. sites and apps. What are the advantages of a Smart DNS service? To answer this question, we must understand how VPN services actually create a private connection. When you start your VPN client, it actually creates an encrypted tunnel to a remote server, and encrypts all the data that flows through it. The VPN client actually encrypts and transmits ALL your bandwidth through remote servers, and therefore the solution is relatively slow and not cheap (unless the VPN providers decide to share your Internet connection with other people - but that's a different story). The bottom line - unless you want to conceal your online identity, VPN is most likely to be an overkill if all you want to acheive is only unblock websites. Smart DNS uses a set of rules on the DNS level to determine which domain calls to proxy, and which not. Therefore, the solution is generally faster than a VPN service since not all your data is being transmitted via a proxy server. In addition, the Smart DNS method allows us to provide a limited free service for users that cannot afford the premium plan. What are the disadvantages of a Smart DNS service? Smart DNS by itself does not conceal your online identity, and does not secure your Internet connection. In addition, some apps (not websites! i.e. Netflix or BBC apps for iOS/Android) can override the Smart DNS configurations by setting the app to call hard-coded DNS and IP addresses. For those reasons, the premium version of Keenow includes a state-of-the-art VPN feature. Why devices and browsers cache DNS queries? DNS resolution only takes few hundred milliseconds, but when a webpage calls 50 different domains it can get a bit tricky. In order to improve webpages loading speed, both Microsoft Windows and Google Chrome have a local cache where all previous DNS calls are saved, and quickly retrieved when you access different sites. In fact, that's one of the reasons that Chrome is such a fast browser.